We asked immediately if other accommodation was available and we were moved to a mobile home which was much nicer. 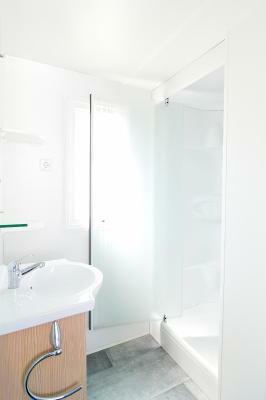 Bright and airy instead of dark and dingy. All of the staff on this campsite are very friendly, the supermarket is reasonable value and the restaurant is good. Standard campsite catering for every sort of holiday you could wish for. As a mature couple we were located away from the hustle and bustle but did not feel too isolated. Good beach nearby with a beach bar. 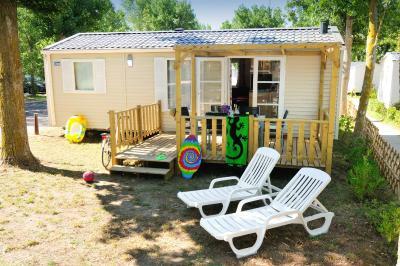 camping que nous connaissons bien, déjà au moins 20 ans que nous y allons, il a beaucoup évolué dans les aménagements, superbe piscine, la climatisation dans les mobil-homes, bonne boulangerie, animations pour les ados et enfants très bien. Il y a un petit train qui va en ville (payant), si on ne veux pas prendre sa voiture, par contre le camping est très grand, mais bien sécurisé. Bons matelas. On était très bien placés. Supermarché et boulangerie sur place. L’emplacement du camping et ces alentours commerces proximité et plage. Camping avec tout ce qu'il faut. Par contre les piscines noires de monde c est horrible. 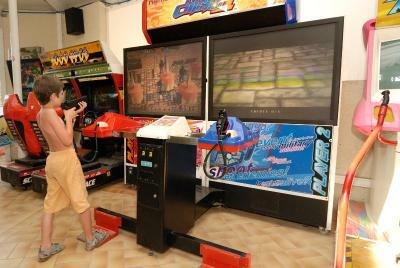 Le camping devrait aussi précisé que tout les jeux qui sont dans le camping(mini golf,trempoline,mini kart...) sont payants à chaque activité ! Même la mini ferme auquel on a unaccès direct est payante elle aussi ! J ai trouvé cela exagéré ! 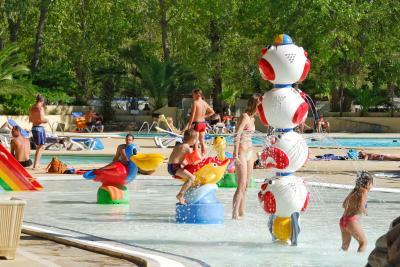 Set 1,650 feet from the Mediterranean Sea, this resort offers a 3281 ft² water park with waterslides, a large pool and artificial beaches. 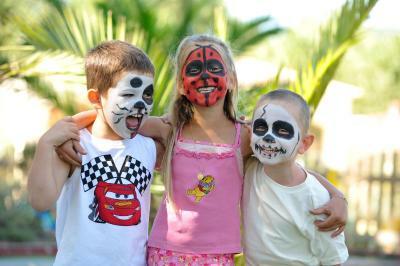 A wine estate, adventure park and animal farm are available for guests. 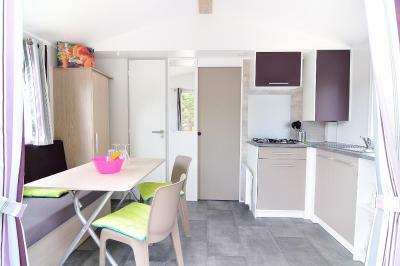 The property offers mobile homes, cottages and pitches and you will be able to buy groceries from the on-site supermarket before cooking meals in your kitchen area. 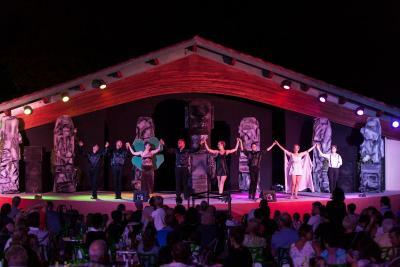 Other facilities include a beauty center, a hairdresser, shops, bars and restaurants, as well as entertainment. 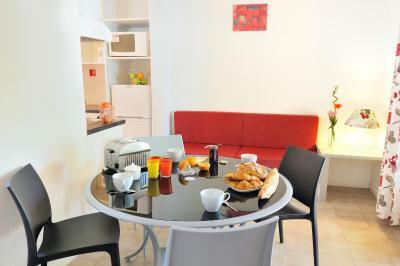 Free private parking for 1 car is possible at the resort and the center of Valras-Plage is 2.2 mi away. Béziers Train Station is 11 mi from the property. 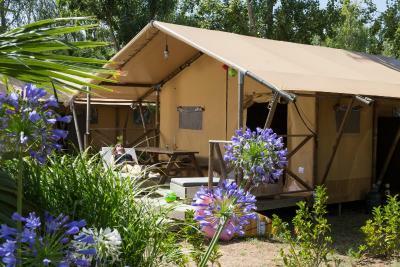 When would you like to stay at Camping Domaine La Yole? 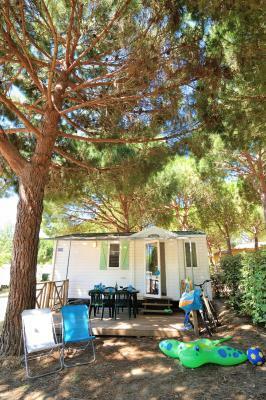 This mobile home has 1 bedroom, a dining area and a fully equipped kitchen with a tabletop refrigerator, a microwave, gas or electric hobs and kitchenware. There is a bathroom and a separate toilet. 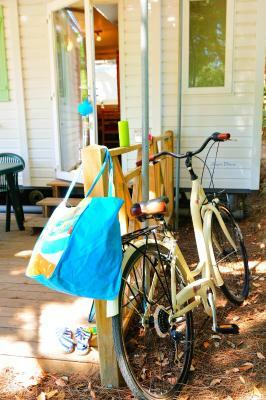 There is outdoor furniture, including 2 deck chairs on the wooden terrace which is covered by a shade sail. Pillows and blankets are provided. 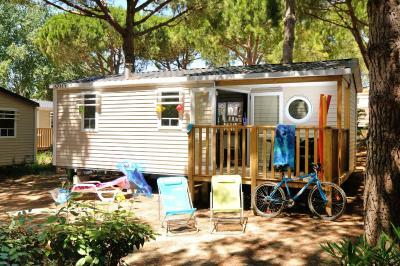 This mobile home has 1 double bedroom, a room with bunk beds and a child's bed that is 26 in wide and can accommodate a person under 40 kg. 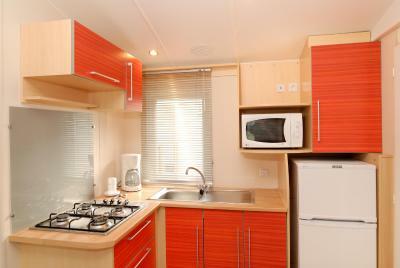 There is a fully equipped kitchen with a refrigerator, a microwave, electric hobs and kitchenware. There is a bathroom with a toilet. There is outdoor furniture, including 2 sun loungers on the terrace which is covered by a shade sail. Pillows and blankets are provided. 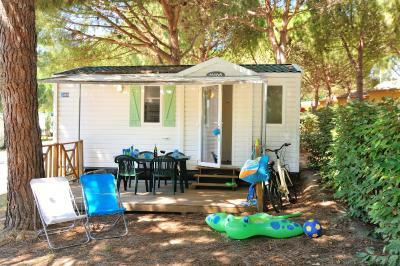 This mobile home has air conditioning, 1 double bedroom and 1 twin bedroom. There is a single bed with a width of 26 in in one of the bedrooms. 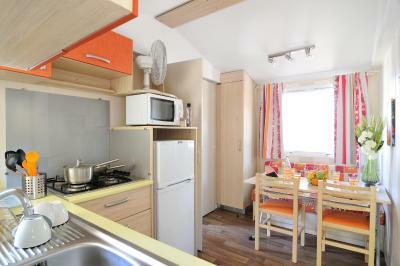 There is a dining area, a fully equipped kitchen with a refrigerator, a microwave, gas hobs and kitchenware. There is a bathroom and a separate toilet. 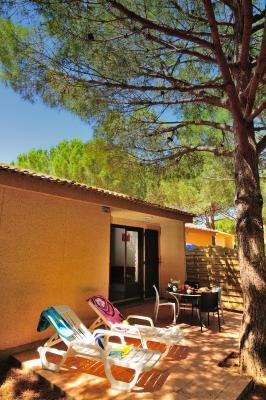 There is a furnished terrace covered by a sail shade with a garden table and 2 sun loungers. Pillows and blankets are provided. This mobile home has air conditioning. 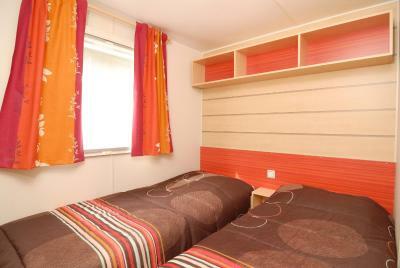 There is 1 double bedroom, 1 twin bedroom and 1 children's bedroom with bunk beds or twin beds, either 70 or 31 in in width. 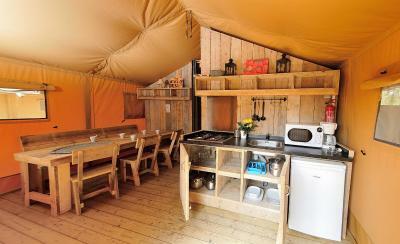 There is a dining area, a fully equipped kitchen with a microwave, gas hobs and kitchenware and a bathroom with a separate toilet. There is a garden with 2 sun loungers and a wooden terrace covered by a sail shade. Pillows and blankets are provided. This mobile home has air conditioning. 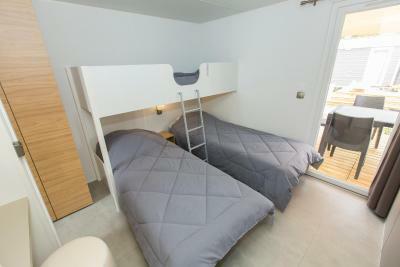 There are 2 rooms with twin beds and a children's bedroom with bunk beds or twin beds, either 70 or 31 in in width. 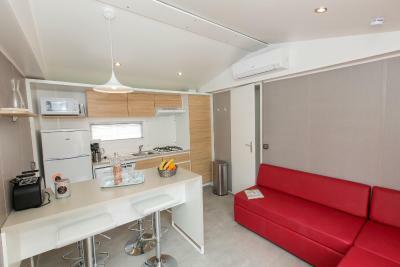 There is a dining area and a fully equipped kitchen with a refrigerator, a micorwave and gas hobs, as well as kitchenware and a dishwasher. There is a bathroom and a separate toilet. 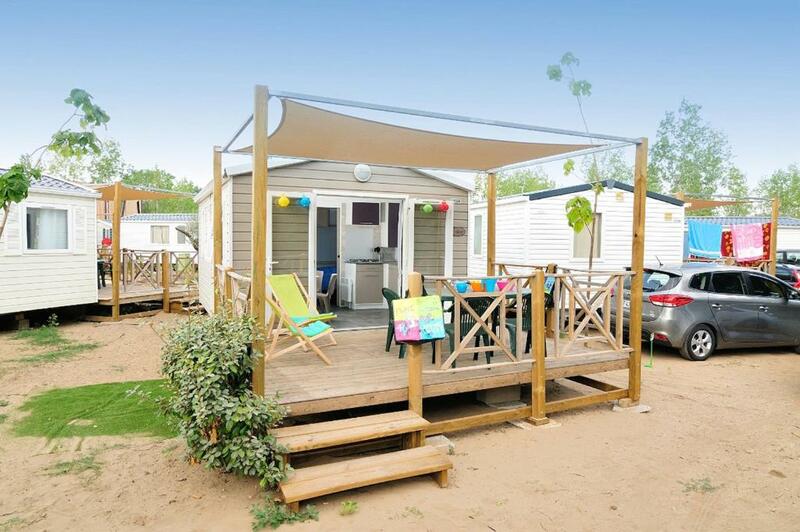 Guests can relax in the garden with a covered terrace, garden furniture and 2 sun loungers. Pillows and blankets are provided and there is free WiFi for 1 device. This mobile home has air conditioning. 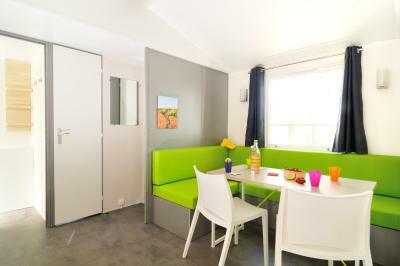 There is 1 double bedroom with a private bathroom that has a large shower and a separate toilet. 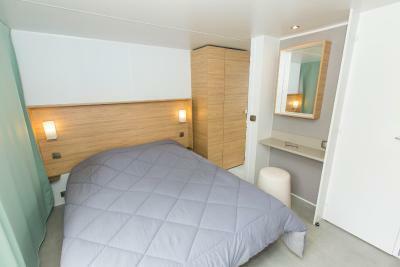 There is 1 triple bedroom that also has a private bathroom with a large shower and a separate toilet. 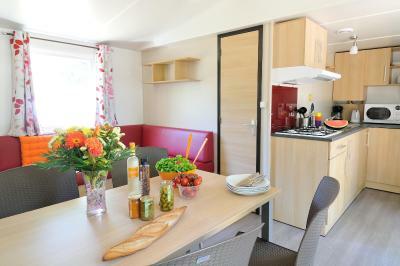 There is a dining area and a kitchen with a refrigerator, a microwave, gas hobs and a dishwasher. Guests can relax on the terrace which has a shade sail. Pillows and blankets are provided. 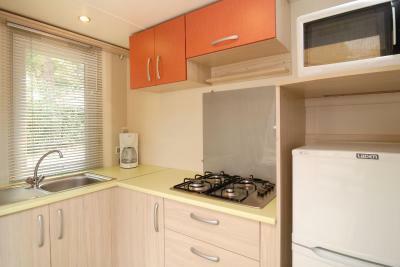 This mobile home has 1 double bedroom and 1 twin bedroom that has beds of 70 or 31 in in width. There is a living room with a dining area and a fully equipped kitchen with a refrigerator, gas hobs, a microwave and kitchenware. There is a bathroom with a toilet and a garden with chairs, 2 sun loungers and a shade sail. Pillows and blankets are provided. 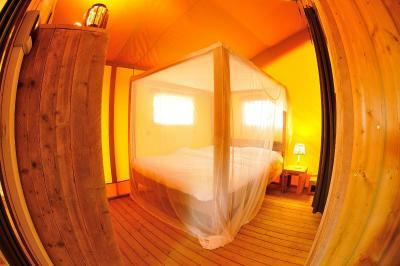 This tent has 1 double room and 1 room with bunk beds and a single bed that is 31 in in width. 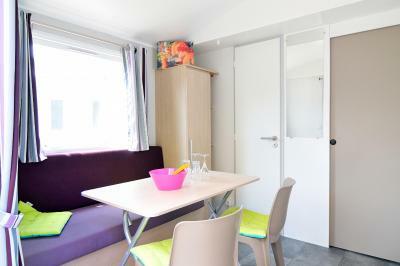 There is a dining area and a fully equipped kitchen with a tabletop refrigerator, a microwave, gas hobs and kitchenware. There is a bathroom with a toilet. 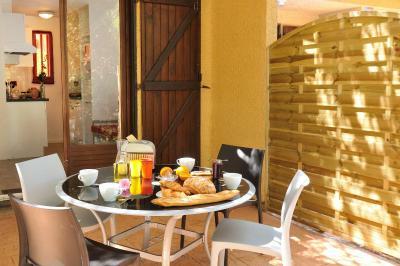 Guests can relax in the covered terrace area and there is also a picnic table and 2 sun loungers. Pillows and blankets are provided. Domaine La Yole is a broad estate, but most of all it is a place you will enjoy staying at, where you'll be given the opportunity to relax, to try our products, to improve your knowledge both on wines and on Mediterranean gastronomy, to discover farm animals and to work out in a preserved environment. 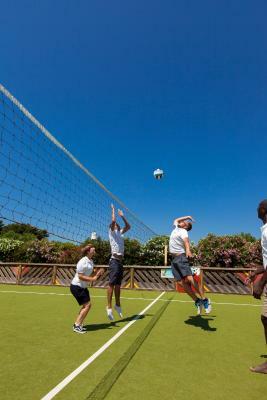 Our 5-star campinglodge offers you a wide range of quality accomodations within a shaded setting, as well as modern comfort standards and services : a waterpark, various shops, bars and restaurants, entertainment. WiFi is available in all areas and costs EUR 8 per 24 hours. 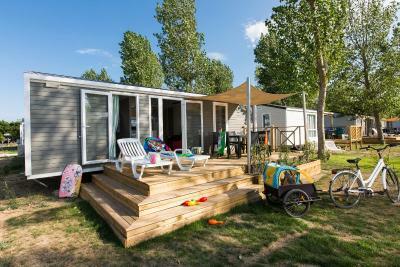 House Rules Camping Domaine La Yole takes special requests – add in the next step! A EUR270 damage deposit is required on arrival (around USD302.47). This deposit will be fully refunded 7 days after check-out, as long as there isn't any damage to the property. 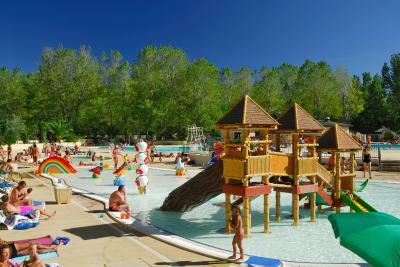 Camping Domaine La Yole accepts these cards and reserves the right to temporarily hold an amount prior to arrival. An end-of-stay cleaning service is available at an extra cost. Please note that towels and bed linen are not provided. Please note that parking for a second car is possible at an extra cost. A damage deposit of EUR 270 is required on arrival. That's about 302.47USD. This will be collected by credit card. You should be reimbursed within 7 days of check-out. Your deposit will be refunded in full by credit card, subject to an inspection of the property. There were ants everywhere in the accommodation. All over kitchen work surfaces. In bed rooms. One bunk bed couldn't be slept in coz it was crawling with them. We mentioned it to staff but nothing was done. We had booked a cabin which turned out to be nothing short of awful. It stank I'd diffusers and was in a poor state of repair. Nit picking but there was no BBQ as standard with our accommodation.